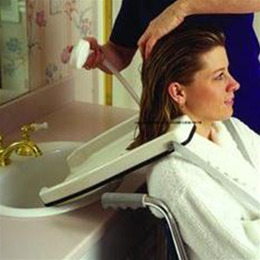 Contoured to fit the neck comfortably and rest on the shoulders for easy shampooing in a seated position. Unique flexible rubber facing surrounds the tray and neck opening to provide superior comfort and prevent slipping. Compact and lightweight, reduces back strain for caregiver. Raised edge prevents water from spilling over. Contoured sides support neck. 35" straps wrap around forearms to stabilize the tray. Plastic material can be easily cleaned with soap or household disinfectant and water. Use with chair or wheelchair. Neck opening: 4 1/2". Weight: 1lb. Latex-free.